In Wrangling James – Book 6 of the Tarnished Saints Series, Mindy MacAllister makes James a very special apple pie. Mindy, can you tell us about it? Honey – drizzle some over the apples lightly. Cinnamon – sprinkle some over apples. Raisins – as many as you’d like. Place the top pie crust over it. Pinch the edges tight, and actually kind of smash down the crust tightly so it doesn’t fall apart. Cut a few slits in top. Place on a pan covered with foil. Here’s the secret. Since I used no flour or thickener, it may become too juicy unless you use older apples. 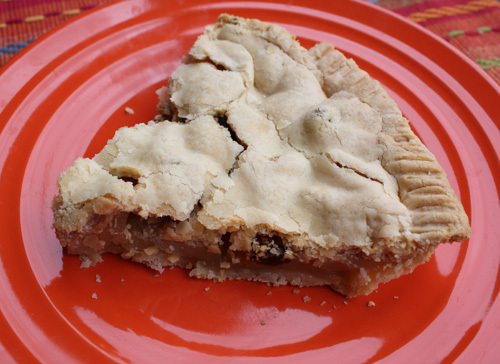 So once or twice during baking, tilt the pie over the sink to drain out the extra juice. Bake about half an hour at 350, or until the crust looks brown and there isn’t liquid bubbling up at the sides. This makes a perfect pie every time. And James loves it!